Oxfordshire County Council’s proposals for a cycle track on the south (inbound) side of the London Road between Gladstone and Wharton Roads goes to the Cabinet Member for the Environment David Nimmo Smith @DNimmoSmit1 on Thursday 27 February. The officers’ report on the proposals recommends approval. There has been some consultation on the scheme and local councillors have tried hard to influence the outcome. How successful they have been isn’t clear from the report. If you haven’t been following the story closely the details in the report – especially the impossibly small and undetailed ‘technical drawing’ – are too sketchy for you to really understand the proposals. Under the scheme there will be a segregated footway/cycleway on the south side of the London Road. Most people prefer this to the shared use solution. 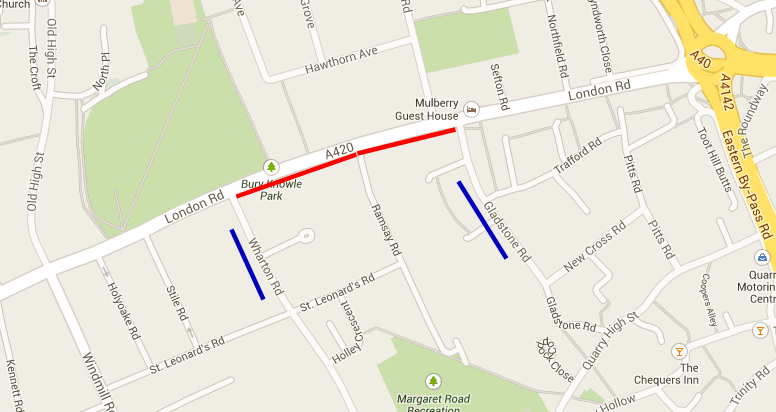 However, it won’t be segregated all the way from Gladstone Road to Wharton Road. “Most of the route will be segregated with some small stretches un-segregated due to narrower footway widths” (Annex 2, Officer comments no. 3). The report doesn’t show where the unsegregated sections will be. Two other points of concern have NOT been addressed. The cycle route crosses Ramsay Road using a “raised junction treatment”. The critical issue here is how the junction will be marked. To allow cyclists as safe and uninterrupted a journey as possible, and recognising they are on a main road crossing a side road, the junction should be marked with Give Way lines and signs on Ramsay Road which give priority to the London Road cyclists. Whether this is intended is not stated: indeed the very last entry in Annex 2 is the only blank box in the ‘Officer comment’ column. Similarly the treatment of the end of the cycleway at Wharton Road is important. Earlier versions of the scheme had cyclists arriving at Wharton Road with no particular provision for them to join the main road safely. In Annex 2 you will now find “By ending the facility at this junction it gives cyclists the opportunity to re-join the carriageway at a point where there is an advisory cycle lane marking.” How this is achieved will be a critical feature, and it is not too late for the Council to add some protective road markings on the main road. As for the rest of the report, it’s notable for its sloppiness. The cyclability audit (para. 3) was about Headington roundabout to the NOC, Churchill and Old Road campus. It’s irrelevant to this scheme. The report has discovered a whole new campus too, the ‘Old Headington campus’ (para. 5). It makes a big thing of the success of the OxonBikes scheme – at best a dubious claim given the failure of the company running it, and with no real assurance other than a hope that a successful replacement operator can be found. It seems likely the scheme will be approved. Let’s hope local residents and Councillors can hold the officers to their promise that “more input will be sought during the detailed design” (para. 15).